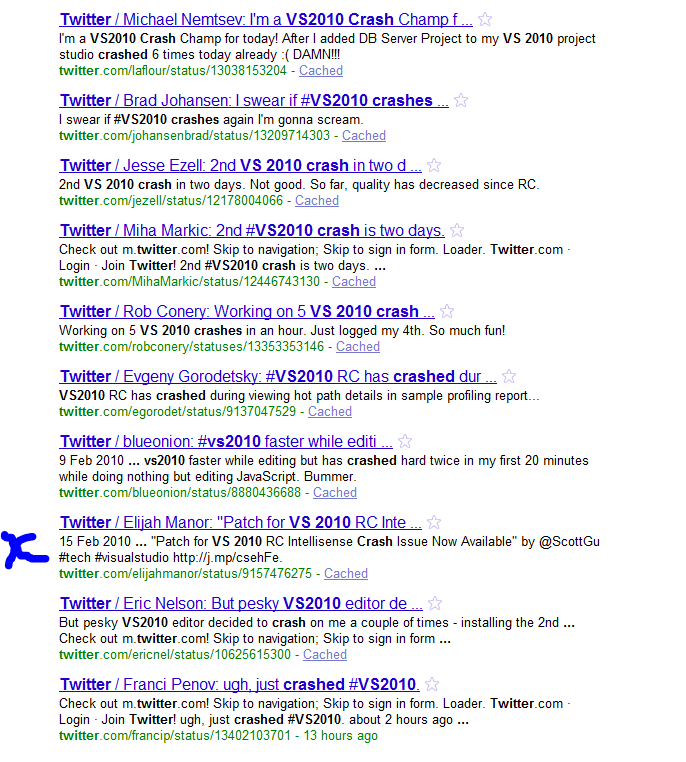 Recently I started using Visual Studio 2010, if you follow me on twitter you probably know that this hasnt been a nice transition for me (apologies for the cursing btw) I ve had many crashes, and I m pretty sure I m not alone, not only a quick search in twitter will reflect this (see image below, the only marked twitt is about a fix for something) , but a some of my co-workers had one or another problem. It would be naive to think all the issues have the same source, and I know that many are related to the plugins ( I use Resharper with xUnit extensions and AnkSvn). What I m trying to say is that this post is not to bash Visual Studio, to be fair the IDE is pretty flashy, shiny, even amazing…. but you know what I want options, something I can rely on and that I can bend to my will. Lets elaborate on that. Using resharper means I m used to using shortcuts, templates and whatnot, I know I should be able to bend an IDE to do what I want so I can code faster, be focused on what I m doing. **On the other hand **I can also see that having a comon IDE within a group means we can share tricks and learn about each other practises. So today I saw this post by Rob Connery and I cant help but wonder, Is Vim the right way to go?, no idea but I know I m ready to give it another try. However Id iek to set my expectations. I think what I would like is a more modular VS (where I can turn things off). Although it s a pain, the Add Reference Dialog **speed is not my main issue, it takes so long to add a reference that at least it makes me think “Do you really want to add that dependecy? **” I would prefer if it wouldnt happen tho.